The annual Quadrantids meteor shower hits its intense peak even before Jupiter comes to opposition on the 5th. The giant planet shines brightly throughout our January nights and Orion, too, is ideally placed in a sky awash with bright stars. What is missing, though, is any sign of Comet ISON. Any hopes that the comet might blossom into a spectacular sight during December were shattered when its icy nucleus failed to survive its brush with the Sun on 28 November. A so-called ghost of ISON did emerge from its perihelion, but this must have been a dispersing cloud of dust which soon disappeared. Searches since then, including by Hubble, have failed to spot anything at all. So much for the Comet Of The Century. Our charts show the Pleiades in Taurus glimmering high in the south at our map times as Orion strides towards the meridian. Trailing Orion are his two dogs, Canis Major and Canis Minor, with their bright stars Sirius and Procyon. Together with Betelgeuse at Orion’s shoulder, these form the Winter Triangle. Orion’s immediate foe, of course, is Taurus the Bull whose main star Aldebaran lies against a more remote V-shaped star cluster, the Hyades. The tips of the bull’s long jutting horns are marked by the stars Elnath and Zeta Tauri and it is just 1.1° north-west of Zeta that we find the famous Crab Nebula. The debris from a supernova explosion recorded by Chinese astronomers in 1054, it lies about 6,500 light years away and appears as an oval eighth magnitude smudge through a telescope. January sees the Sun climb 6° northwards as sunrise/sunset times for Edinburgh change from 08:43/15:49 on the 1st to 08:09/16:44 on the 31st. The Moon is new on the 1st, at first quarter on the 8th, full on the 16th, at last quarter on the 24th and new again on the 30th. With no moonlight, and if the weather permits, this could be good year for Quadrantid meteors. The shower lasts from the 1st to the 6th but has an unusually brief peak when the meteor rate could reach 80 or so per hour for an observer under ideal conditions. That peak is expected at about 19:00 GMT on the 3rd when the radiant, the point in the sky from which the meteors diverge, lies rather low in the north so that only a fraction of the ideal number of meteors may be seen. Even so, I’d expect to see several long-trailed meteors speeding overhead from north to south. Later in the night, the radiant follows the Plough as it climbs through the eastern sky. The brightest object on our charts, Jupiter, shines at magnitude -2.7, three times brighter than Sirius, when it stands opposite the Sun on the 5th. It then rises in the north-east at sunset, crosses our high meridian at midnight and sinks to set in the north-west at dawn. The arrow on our chart shows it tracking westwards against the stars of central Gemini, some 10° below and right of Castor and Pollux. 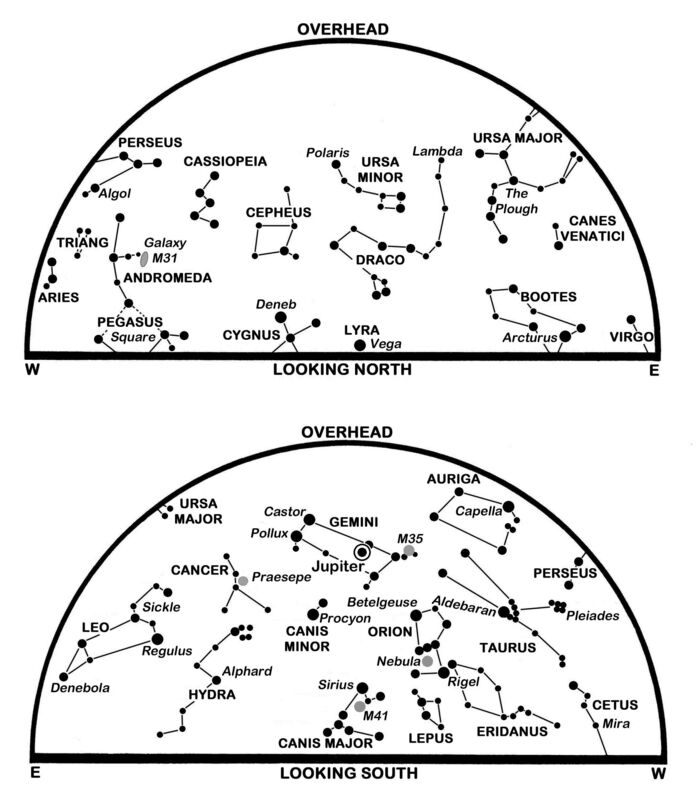 As such, it is unmistakable above and to the left of Orion later in the night. Look for it to the left of the almost-full Moon on the evening of the 14th. Jupiter is 630 million km distant at opposition, its slightly rotation-flattened disk measuring 47 arcseconds in diameter. Appearing even larger than Jupiter is the dazzling magnitude -4.3 evening star Venus which sinks from 10° above Edinburgh’s south-western horizon at sunset on the 1st to set itself 100 minutes later. A full arcminute in diameter but only 4% illuminated, its slender crescent is obvious through binoculars. Weather and horizon permitting, the view may be more stunning on the 2nd when Venus lies 2.7° below-right of the narrow arc of the 2% illuminated Moon. Venus soon disappears from our evening sky as it sweeps through inferior conjunction on the Sun’s near side on the 11th. Within another four or five days, though, Venus reappears as a morning star in the south-east and by the 31st it rises two hours before the Sun, shines at magnitude -4.6 and is a 12% sunlit crescent 52 arcseconds across. Mercury emerges as an evening star later in the month as it moves to lie 18° east of the Sun on the 31st. Between the 19th and 31st, its altitude in the south-west forty minutes after sunset doubles from 4° to 8° as it dims only slightly from magnitude -0.9 to -0.5. Use binoculars to spy it in the twilight if you have a favourable horizon. Mars rises in the east in the middle of the night and is tracking eastwards against the stars of Virgo to pass 5° north of Spica on the 28th. Its pink-red glow brightens from magnitude 0.8 to 0.3 and its disk swells to 9 arcseconds by the month’s end, large enough for some surface detail to be visible telescopically. It is best to observe it when it is highest as it crosses the meridian at an latitude of almost 30° shortly before dawn. The Moon lies alongside Spica and below Mars on the 23rd. Saturn, another morning object, is creeping eastwards in Libra, about 6° to the east (left) of the wide double star Zubenelgenubi. It rises in the east-south-east at about 04:20 on the 1st, two hours earlier by the 31st, and at mag 0.6 to 0.5 is the brightest object low down in the south before dawn. When it lies alongside the Moon on the 25th, its disk appears 16 arcseconds wide while its glorious rings are 37 arcseconds across and have their north face tipped 22° towards us. This is a slightly-revised version of Alan’s article published in The Scotsman on January 1st 2014, with thanks to the newspaper for permission to republish here.